For awhile after Haiti, life didn’t seem exciting enough to blog about. Let’s be honest – just buying groceries in Port-au-Prince is an adventure. It was a strange time in life because we didn’t have a plan. But not having a plan worked out. As you know, we moved back to Joyce Lane Farms. Josh has gotten his real estate license because it’s something he’s always been interested in and ….why not? I got a job working for a company called Eventbrite. I work in customer service and I love it! It’s a fantastic company and I get to work from home. Win, win. And Joyce Lane Farms became for farmlike. We have a pretty decent garden, a few chickens, and this summer we had bees (they since died but we’re trying again in the Spring). Then came Margot. 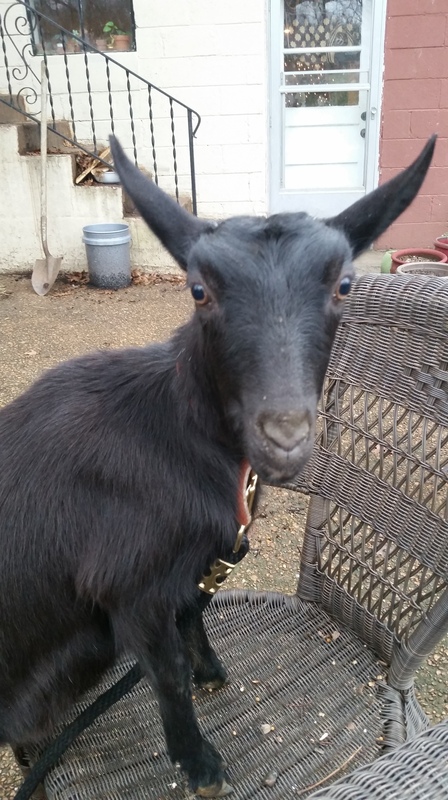 For Christmas, Josh got me a pet goat named Margot (yes, they’re legal but require a permit…which we are getting). She is a dairy goat so we’ll probably milk her late summer/early fall. So now, what started as a joke became legit. We have all of the beginnings of an urban farm, y’all. Not to mention the girls make a clothing line called Hey Wanderer and we help some friends with selling artisan goods from Haiti. Maybe someone called us Wal-Mart for hipsters once. Come get your goat cheese, kimonos, and fair trade artisan goods here, guys. So somehow we fell into this big dream of living communally and with less assistance from “the man.” Not having a plan turned out to be pretty sweet. Next up….meet the members of Joyce Lane Farms.